1. Preheat oven to 325°. Place ham, fat side up, in shallow roasting pan. Arrange onion and bay leaves on ham. Sprinkle with sugar, parsley sprigs, cloves, and peppers. Insert meat thermometer in center of thickest part, away from bone. 2. 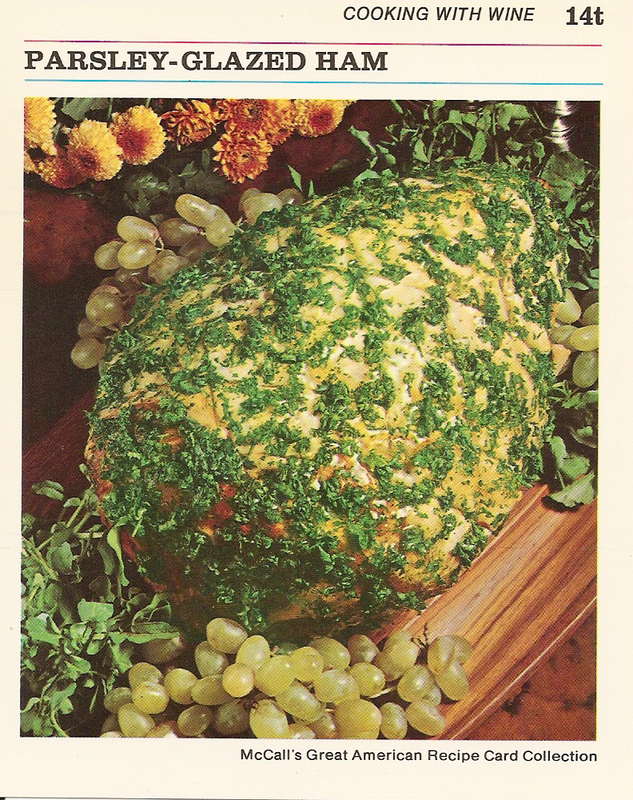 Pour wine around ham. Cover pan tightly with foil. Bake, basting every 30 minutes with wine in pan – about 3 1/2 – 4 hours, or until meat thermometer registers 140F. 3. Remove ham from oven. With sharp knife, carefully remove any skin and excess fat. To score: Using knife and ruler, make diagnoal cuts in fat (do not cut into meat), 1/4 inch deep and 1 1/4 inches apart, to form a diamond pattern. Cool. 4. Refrigerate ham, covered, several hours or overnight. 5. Make Glaze: In 1/4 cup cold water in small saucepan, let gelatine stand 5 minutes, to soften. Add white wine. Stir constantly over medium heat, until gelatine is dissolved. 6. Set bowl with gelatine mixture in ice water, and let stand about 15 minutes, or until slightly thickened but not set. Add chopped parsley; mix well. 7. Remove ham from refrigerator. Spoon half of glaze over ham. Refrigerate ham 30 minutes. 8. Reheat remaining glaze. Set it in ice water to chill and thicken slightly. Spoon over ham, coating completely. 9. Refrigerate 1 hour, until glaze is set. Makes 20 servings.